The incredible performance of Martin Solveig has barely finished at DupleX and the next episode of our world class flagship night, DupleX Presents, is already just around the corner. On the 8th December we will host one of the best Dutch producers in the world right now at DupleX, The Rooftop Venue – R3HAB, currently placed 12th in the Top DJs of the world, according to the most recent DJ Mag rankings recently released. Whether on the festival main stage or your favorite playlist, Dutch artist, DJ and producer R3HAB continues to take electronic music to new and unprecedented heights. A globetrotting Dutch-Moroccan talent hailed by the likes of Forbes and Billboard Magazine as the future of his craft, Fadil El Ghoul has taken full control of his sound and presence over the last 7 years, garnering hundreds of millions of streams across the board whilst continuing to hold a staggering presence on the global club circuit, all without a formal record label to lean on. 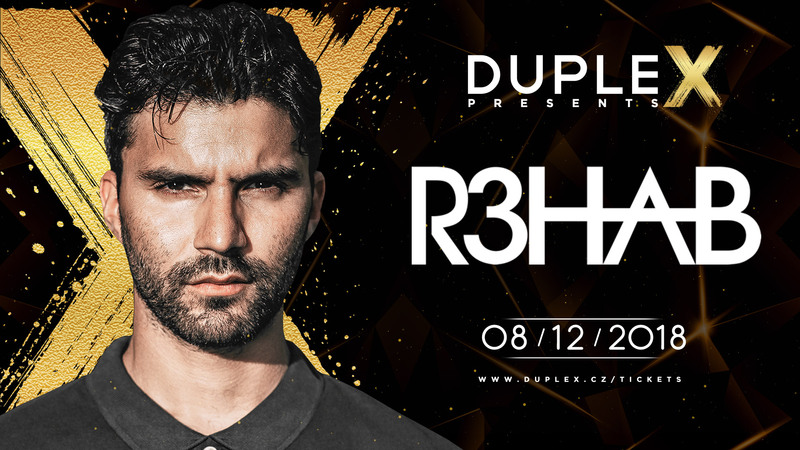 R3HAB will perform at DupleX, The Rooftop Venue on December 8th, 2018. Prague’s faithful have been patiently waiting for 2 years since R3HAB‘s last show in the Czech Republic when he played as headliner of the Czech biggest indoor festival of electronic dance music. As always on our flag-ship DupleX Presents nights, the supporting DJs will be elite representatives of DupleX resident DJs – Hungarian DJ & producer Chris Davies, Turkish DJ John Noah and Czech DJ Namaas. The DupleX good news just gets better and better, as the cherry on the cake for our final DupleX Presents night of 2018 is that the line-up will be completed by the most famous Polish DJ and producer – Skytech. Though the outset of his career was hallmarked by a string of ground-breaking club records, the past 12 months marked a change in pace and presence for R3HAB. Released in the Fall of 2017. Debut album TROUBLE marked a colossal first for the Dutch native. Released independently through his own R3HAB Music brand, the LP to date has garnered more than 200m streams globally. Attracting attention across the biggest New Music Friday and Today’s Top Hits Playlists, sought after singles “Trouble,” “You Could Be” and “I Just Can’t” remain indisputable proof of R3HAB’s reliable stamp of club savvy pop prowess. Without alienating his widespread fan base, his sound now represents a crossroad between the club floor and the Billboard charts that refuses to waiver in its identity and energy. As well as his original release credentials, R3HAB remains a go-to remixer within the global market. Having already taken on Rihanna, Justin Bieber, Lady Gaga, Bruno Mars, Zara Larsson and The Chainsmokers, the coming months also see him remixing Rita Ora, 30 Seconds to Mars, Sigrid, Rudimental, Jessie Ware and many more. We are all looking forward to welcoming R3HAB to the best club in Prague, bringing you the biggest stars of EDM music, on December 8th at DupleX, The Rooftop Venue!